Baking powder --- 1 tsp. TABASCO® brand Chipotle Pepper Sauce --- 2 Tbsp. Vanilla extract --- 1 tsp. Chocolate ice cream, rich and creamy --- 1 pt. Grease a 9" x 13" baking pan. Cream butter and sugar together in a mixing bowl until smooth. Add eggs one at a time, then add vanilla extract, whole milk and sweetened condensed milk. Mix on high for 1 minute. Combine baking powder into flour; slowly add dry ingredients to the wet mixture on low speed. Pour into the greased pan. While Cake is baking, combine all Topping ingredients. When Cake is done, remove from oven. Pierce Cake with a fork and cover with Topping. 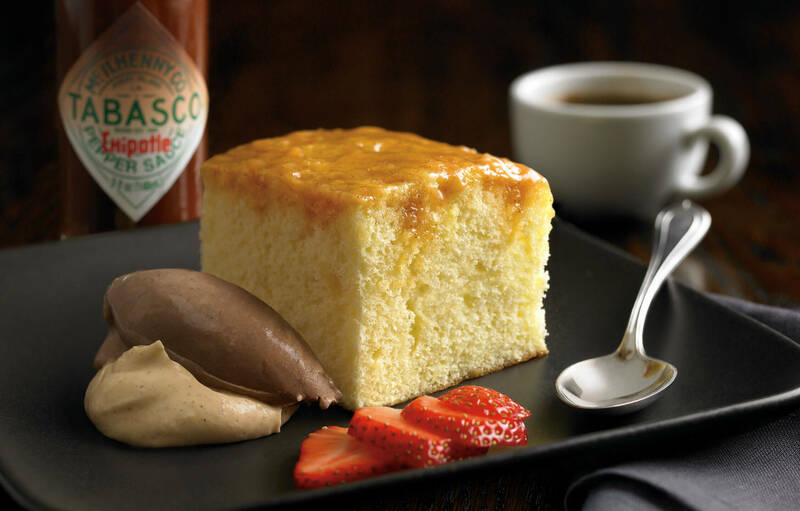 Allow chocolate ice cream to soften enough to fully mix in TABASCO® Chipotle Sauce. Once fully combined, return to the freezer until needed.